It's April 2007. I quit my job last month, oversaw one big home remodeling project, but I can't seem to get the second remodel project - a foundation repair - moving. I think I'll go on a bike ride. I'm selecting the Middle East for this ride because… well, that's where the action is. Back in '84 I did the Eastern Bloc because that's where the action was then, and in '95 I cycled Vietnam for the same reason. In '84 I had made it from Sweden to Istanbul. I'm a little older now, but if I can connect Istanbul to Cairo, that would be very cool. I study some maps, and it seems reasonable. 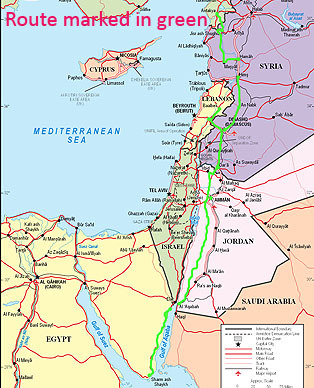 Cut across Turkey, drop into Syria, then Lebanon, back into Syria again, then Jordan, then across the Sinai. I go to the local bookstore and, after flipping through their bike-touring books, buy a book called Adventure Cycle-Touring Handbook. It's loaded with great information - some stuff I knew and forgot, and some stuff I never knew. I'll need a guidebook for the route. I go on Amazon.com and do a search, and learn that there's an out-of-print Lonely Planet book called Istanbul to Cairo, and order it. I visit the local library, and pick up four country-specific LP guides: Turkey, Syria & Lebanon, Jordan, and Egypt. I sure won't be able to travel with all these books (the weight issue) but I can at least use them for pre-ride research. I need to chase down visas. A quick web search shows that I need visas for all five countries, but that I can get two of them ten miles away, in San Francisco. The next day I hand-deliver my passport and application fee to the Jordanian consulate. Five minutes later I have my first visa. I drive across town and hand the passport to the Egyptian Consulate. "Two days," I'm told. OK. I was sort of hoping for another instant visa, but I can't complain. Back at home my web research indicates that Syria is the trickiest to get, and Turkey the easiest. I phone the Syrian consulate, down in Newport Beach, leaving a message that my application is on the way, and asking for a double entry, since I'll be entering from Turkey, then reentering from Lebanon. I get a call back the next day, confirming that Syria has a two-entry visa. I load on the charm, and ask how quickly my passport can be processed. "One or one and a half weeks." Oh well. Istanbul to Cairo, or Cairo to Istanbul? I'll be flying into one city, and out of the other. I need to decide whether to head south, or north. I'm sure that Istanbul is the easier city to adjust to, to get your game on. I believe that winds generally blow toward the equator, and when I'm bicycling, I really hate headwinds. The guidebooks and web sites clearly state that, after May, it's too hot to bicycle in Jordan or Egypt. Since the soonest I can get this trip started is probably early May, there's a strong argument to start in the south and head north before the heat really kicks in. The southern countries are smaller. This has to sound silly, but for me, a border is a big reward, and I can tell that Turkey will require a few weeks to get through. I haven't biked in more than a decade, and I'd hate to fail before even making it through one country! I go to Lonely Planet's travel blog, Thorntree, and post a question about wind direction. A few days later I have a bit of feedback, but nothing definitive. One comment offers a new argument for starting in Istanbul. If I bicycle east from Istanbul, versus west to Istanbul, I will avoid having the sun in my face during the hot afternoon hours. Hmmm. In the end it's the acclimation argument that sways me. I'm sure that Istanbul and western Turkey is a hell of a lot easier to deal with than Cairo and the Sinai, so I'll start in Turkey. I also need to have the bike checked out. It's my 1984 Univega Sportstour, the bike that I used in '84, and in '95, and the only bike I've owned. 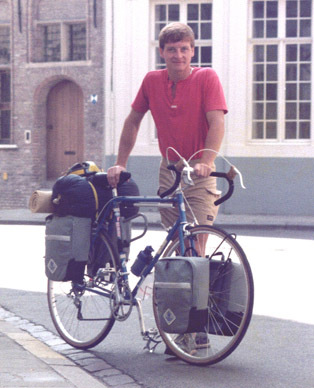 The bike's had two tweaks: in '84, just before beginning my Europe ride, I upgraded to heavier-duty wheels, and in '95 I splurged, and replaced the 12 speed gearing with 18-speed. (Rear = 14 through 28; front = 46, 36, 24. Calculates to a low of 27 gear-inches, whatever that means!) I'm not looking to make any fancy upgrades this time; I just want to know that it's safe. I also need to get some bike equipment. On my other two rides I rode with four identical Kangaroo panniers. Somehow, I can only find three. I know the missing pannier's going to pop-up, but I need a contingency plan. a slightly used bright-green riding jersey. All this for $145! I ask them if they can give the bike a checkup, but they're backlogged. After a quick glance, one person says that maybe my headset needs attention. Here in the Bay Area, Valencia Cyclery has a great reputation. So I take the bike into the City, and visit the shop. There a mechanic says that the headset seems OK, but he recommends a new chain, new cassette, and a few other items. Hmmm. I decide to pass on the maintenance suggestions - I'll get a third opinion. I do decide to pick up three new tires (the hard to find 27-inch Continental Gators) and four new tubes. Unfortunately, no one makes foldable 27-inchers any more, so if I elect to bring a spare tire, it's going to be one of these Gators, tied somehow to the back rack. Logan, my neighbor, and a serious bicyclist, suggests that I visit the bike shop just down the street: Bike-RX. I do, and Colin says that the bike's OK, but that the sheathing for the brake and gear cables is pretty beat, and that maybe I'll want to replace the chain. I agree to the suggestions, and use the visit to purchase a different cluster remover (apparently the one I've owned for decades doesn't even fit my bike) and a link removal device. Oh well - once again I'm going to be traveling with bike tools that I have no idea how to use… I book a ticket to Istanbul for 8 days from now. That should be enough time for my passport to get back from the Syrian Consulate. I don't have a Lebanese visa, and won't have time to get it before leaving, but that visa's supposed to be easy enough to get at the border. I'll be landing in Istanbul on midnight of May 5th, and returning from Cairo on June 19th. So if I make it through the first part of the trip, I'll be desert-riding in June. That should be fun. It's time to get in some practice rides. It's good that I get in these practice runs, because there's a lot that I don't know. First of all, I can't get the shoes to clip to the pedals. The guy at the shop specifically selected this pair of shoes because the cleat would work with the pedal, but something's wrong. I go back to the shop where he takes a close look, and suggests that I use a pen to trace the pedal on the bottom of the shoe, then cut off some of the rubber that seems to be getting in the way. It works, and now, after a couple of tries, I can step into the clips, and get attached. 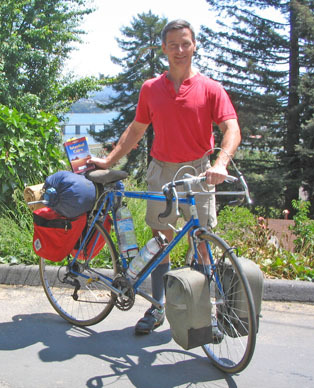 To mirror real-ride conditions, I fill half-gallon water jugs, toss them in the panniers, and go for a 30-mile ride. No surprises, and that's good. Between Ariha and Wadi Musa be prepared to be pelted with sticks and stone by kids. They may also spit and attack you with their fists - you can you can scare away a group of five, but ten are uncontrollable… Unfortunately the ferry ride out of Jordan can be one of the best parts of a trip to Jordan for cyclists because of the amount of harassment they tend to received in that country. There is no way to cycle along the Kings Highway without getting stoned. We read it in your guidebook before leaving, but thought that kids would not stone three male adults with beards and long trousers who are looking angry. We were wrong. And there are not only some groups of kids who try to stone you, but basically it's becoming a major hobby for all male children between three and 20. Cycle in the morning when children are at school, and plan to spend plenty of time discussing and waiting; you probably won't do more than 40km a day." My panniers have American flag patches on them; sewn on for the Vietnam ride, since I had been warned that I didn't want to be mistaken as a Russian. Now those American flags were looking a little provocative. I removed them, and placed an order with flagline.com for five new flag patches - one for each country I expected to visit. I'm figuring that this gesture of solidarity can only help. A day or two later I'm in a fabric store, trying to find fresh heavy-duty elastic to replace the somewhat stretched-out elastic on the backs of my panniers. No luck finding heavy-duty elastic, but I hit upon an idea - I'll pick up a knitting needle for dog-defense. The clerk shows me where the knitting needles are, and right next to them are super-sized real needles. Wow. I pick up a pack of 4 for $3 bucks. The long one in the pack is as long as any knitting needle-and looks a hell of a lot scarier. Maybe I can attach this to the end of my aluminum pole, or maybe it will be fine as is. (When I hunch over in a bicycling-like position, it's clear that my hands are right near my calves, and that all the action in a dog-event will be happening right there, where my calves are. My super-sized needle will probably be fine as is. I've got 6 weeks to get from Istanbul to Cairo. For there to even be a chance of this happening, I'm going to need to take a straight line through the center of Turkey. The guide books don't mention this route: seems that the traditional routes east are either along the southern coast (lots of Roman ruins) or the northern Black Sea coast (ottoman construction, seaside villages, etc.) Oh well. My Hema-brand Turkey map (1:750,000) has shading that indicates that much of Turkey is mountainous except a patch in the center, so, never mind the shorter distance associated with a straight line - these flat stretches will help me knock off the miles as well. 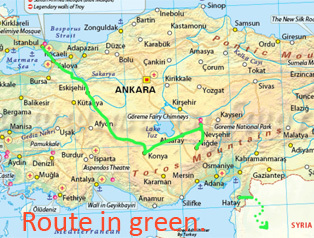 My wife has a childhood friend a few days' ride from Istanbul along this route, so that's a plus. One negative: there seem to be some ugly mountains separating the center of Turkey from my next destination: Syria. Oh well - I'm taking this day-by-day. Let's see if I even last a week on this damned bike. My passport arrives back from the Syrian Consulate. I go back to the local bike store, and have the bike boxed for the flight. I grab a junk suitcase that I'm willing to leave in Istanbul, and do my final packing. I fly out tomorrow. 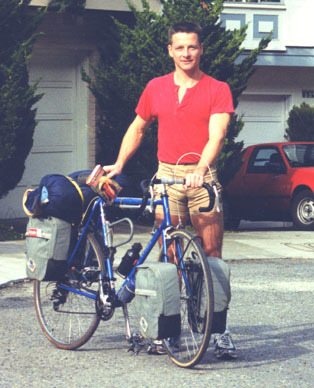 Then drop down through Syria, Lebanon and Jordan to Egypt..
1984 saw me with my brand new Univega Sportstour. 1995 saw me with my 11-year-old bike. Now, in 2007, it's time to take the rig out again.